Celery keeps me happy till it grows in the garden. I grow it from seeds and it takes ages to germinate but when it grows well, it grows really well. Mostly the stalks are thinner than those available in the market, but it is packed with flavor. I add it in egg scrambles, in lentil soups and in my smoothies but since this is not something I like as much as good old coriander greens, I probably wouldn't like a pesto or chutney made with it, if I want to consume this wonderful healthy herb in larger amounts. I make tofu or paneer scramble with it, a scone with celery, paneer and crushed peppercorns is an old favorite and I keep repeating this combination for paneer scrambles and curries too. One day when the husband said if I have posted this recipe on the blog or not, as he had been taking this to his lunch box quite often these days and lining it, I had to check if I have. How simpler things get neglected for the more pretentious ones. No more I thought and here it is..
Heat the ghee in a a pan and tip in the chopped onions and celery together. Saute for 2 minutes and then add the tomatoes and salt and pepper. Stir and cook till the tomatoes are mushy. Add paprika and crushed peppercorns and mix well. Scramble the paneer by hands and add to the cooking mixture, stir and mix well and add a cup of water, simmer the curry for about 5 minutes. 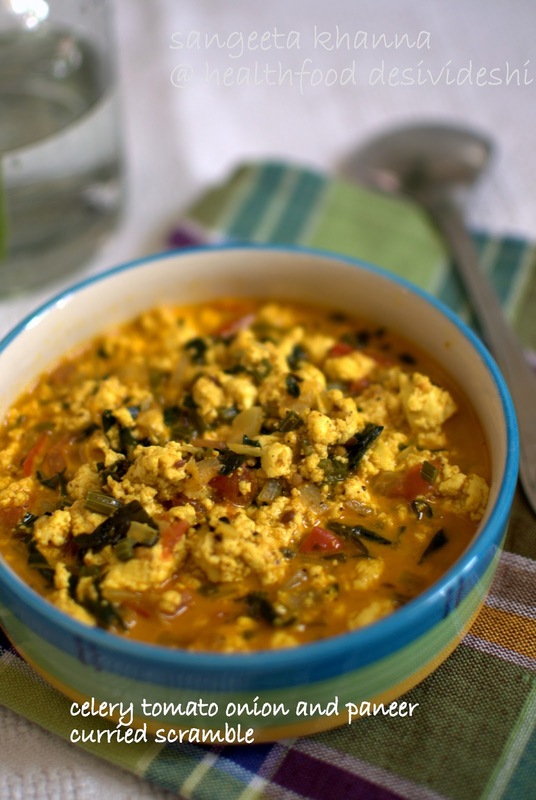 This curried scramble tastes good hot or cold. It can be a one pot soup meal if made thinner with more added tomatoes but a curry for chapatis is also good this way. You might like to add some cooked pasta, boiled pearl barley or just some leftover cold rice to make it a wholesome meal. You could use chicken mince if you like or mutton or lamb mince if you have some time to slow cook this curried scramble, you can't go wrong with such use of celery. yum yum and delicious recipe.